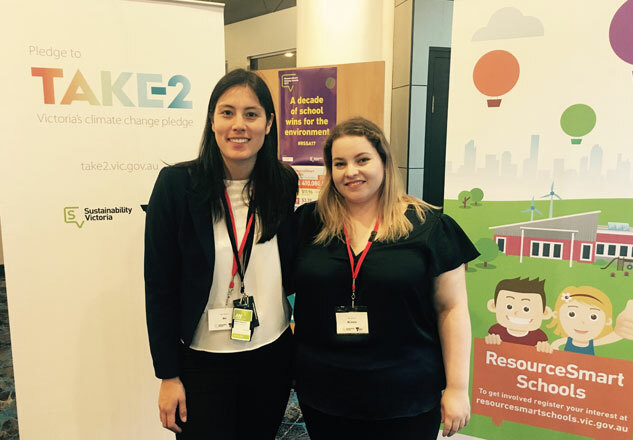 It was a big week for Primary as Mel and Michelle from our team celebrated the winners and finalists of the ResourceSmart Schools Awards 2017 at an official awards event held at the IMAX Theatre Melbourne Museum on Monday 16 October. This year marked the tenth anniversary of the awards, which are Victoria’s largest sustainability awards for schools. For Primary, this was our sixth year delivering the school’s outreach and event support for this highly successful program. Primary’s Account Director Mel Bairstow says it is always rewarding to see hundreds of entries come from all over Victoria, showcasing many inspiring sustainability projects and school communities. “We were thrilled to see teachers and students from all over the state gathered together to celebrate the occasion – some even came from as far afield as Kaniva and Warracknabeal! This year’s event was hosted by gardening guru Costa Georgiadis of ABC’s Gardening Australia. Bringing his signature high-energy style and a genuine passion for the environment, he was a tremendous hit with both students and adults. The ResourceSmart Schools Awards are part of the ResourceSmart Schools program to help recognise schools that embed sustainability into everything they do, and acknowledge the steps taken to minimise waste, save energy and water, and reduce greenhouse gas emissions.